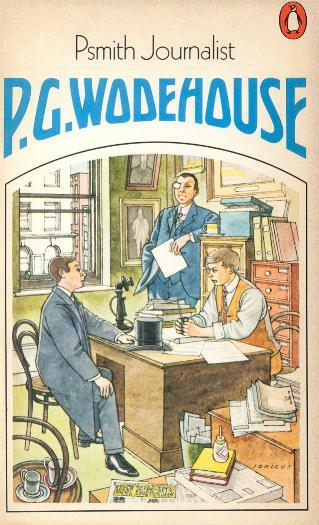 Some years ago I wrote a scholarly investigation on the role of menswear in P G Wodehouse’s fiction (read about it on this page). As part of the background reading I waded my way through all his Psmith novels. They’re not my favourite Wodehouse stories, but I do have a fond appreciation for his cautionary tale about New York journalism in the early jazz age, Psmith Journalist (1915). It isn’t a Jeeves and Wooster novel. It doesn’t produce rollicking, thigh-slapping hoots of laughter, though there are some fine funny moments. Rather, it is a study of an urbane and resourceful Cambridge student on the loose in hedonistic and slangy New York City, of how he runs rings around the utterly corrupt worlds of the yellow press and housing racketeers. 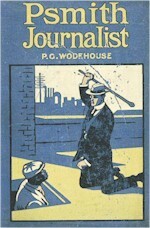 Psmith, the eponymous hero, has been encountered before in earlier Wodehouse novels, mainly in a supporting role to his cricketing hero Mike Jackson. In this novel, Psmith wastes no time in getting on top of all situations that present themselves. (I edited this paragraph in my original post when George Simmers put me right on a fact I got wrong, that Psmith Journalist first came out in magazine form in 1909.) It’s an interesting novel because it doesn’t mention the war. It was written when Wodehouse was living in the USA, when the US had not yet entered the war. Wodehouse was fully occupied earning a living on Broadway, writing for magazines and the musical theatre, so his fiction naturally reflects this, rather than trench warfare and the home front. But the most rewarding aspects of Psmith Journalist are its coruscating analyses of the US magazine industry, and the slog of a journalist’s life sub-editing appalling things for an appalling magazine. Billy Windsor has been appointed the temporary editor of Cosy Moments, a foul-sounding agglomeration of trite tat for the masses. He meets Psmith and Mike during a contretemps over a stray cat, and Psmith – bored with the cricketing tour with which Mike is absorbed – decides to help Billy Windsor out, whether Billy desires this or not. The scene could now be set for a series of catastrophes in which Psmith wreaks mayhem in New York in a Woosterian manner, because that’s what we expect from Wodehouse. But no: Psmith is the diametric opposite to Bertie Wooster. He is personally uncharming, but resourceful, annoyingly clever, and dashed efficient. Psmith can sort out every situation, every calamity, and deal with any specimen of humanity, and he always ends up on top. For readers accustomed to (and maybe bored with?) the personal disasters that Bertie Wooster trails behind him like clouds of glory, Psmith as a character is a remarkable tonic. There is prize-fighting and boxing, there are New York night-clubs, there is election corruption, there is a good deal of Bowery dialect, there are shenaniganical plot twists, and throughout every farrago, Psmith sails supremely confident. No-one is hurt, no-one is seriously damaged, and Psmith actually gets the chief sufferer to pay him to go back to Cambridge. Thankfully, there is no girl: Wodehouse had not yet got to grips with his best way of writing female characters, and Psmith simply ignores them. Enjoy: I do, every time. The book does not mention the war because it was written – and serialised in The Captain – in 1909 – 1910. Book publication in 1915 – perhaps because Wodehouse’s reputation had by then grown sufficiently for a publisher to be interested. Thank you, George! Will edit the piece to head off the Wodehouse correctional mafia. I remember giving up on Psmith on the irrational grounds that he was not Bertie! Wish I hadn’t, reading this. Could we get one of the current newspaper mafia to produce real-life Cosy Moments – Mr Murdoch, perhaps? Delighted by this review! Psmith is by far my favourite Wodehouse creation and one of my favourite characters of all time. His composure, his cunning, and his great delight in life make him irresistible to me. I love Psmith in the City best but but enjoy all his appearances. Well I’m pleased that you like it! 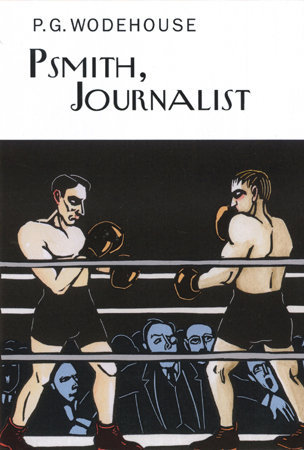 I like Psmith the journalist for a number of reasons, not least because, as an old hack myself, it plays to every young journo’s fantasy of doing the big expose and living on the edge. But I write here not for that but to let you know, Kate, that a section of PGW’s ongoing readership collected loosely around the Plumtopia website is busy debating the Middlebrow Wodehouse collection of essays (yes, we know it’s a year old but the lady who writes the Moulder’s Lane blog only just found it). I’m wondering whether you as a contributor and a specialist in middlebrow lit might like to look up Moulder’s Lane in the first instance and favour us with a comment. Toodle-pip. Yes I will; thanks for letting me know, as I had no idea the book was actually being read!